The Pawling Library seeks to serve the Town of Pawling, including the Hamlet of Holmes as well as the surrounding areas, by making high quality library materials available to all community members free of charge, for the purposes of personal enjoyment, self-improvement or academic inquiry. By meeting the community members personal needs, we hope to encourage enthusiastic readers of all ages, dedicated to personal enrichment and learning. The library has 8 computer work stations available for public use. All public of our computers have high-speed Internet, Microsoft Office, and printing capabilities. Our library is equipped with free WiFi access for use by patrons with their own laptop computers. Our children’s area contains an AWE computer for use by the children. This touch screen system is pre-loaded with a variety of learning software. The Children’s area also features two Kindles running Amazon’s Freetime App, which provides a curated suite of books, videos, games, and apps, while blocking access to the general web. Our library has a fax machine and fax dedicated phone number in order to send and receive faxes for our patrons. For a nominal fee, your faxes can be sent, or received and held for pick up at the library. Our fax number is 845-855-8138. Our library offers scanning service at the Circulation Desk. Your documents can be scanned, and then emailed to an address of your choice or saved to your USB drive. The Pawling Library now offers free delivery of materials to persons who are physically unable to visit the library, including the elderly, the disabled, and those who are temporarily incapacitated by illness or accident. We can deliver books to retirement communities, senior centers, and private residences. You can request books of your choice, or have our Homebound Services Representative Evelina, select titles according to your interests. With the help of volunteers and donations, the library maintains a Little Free Library located at the Telephone Pioneers Shelter, a popular destination for day-hikers, and a sleeping shelter for AT through-hikers. We also offer backpacks for checkout that come with items helpful on the trail. 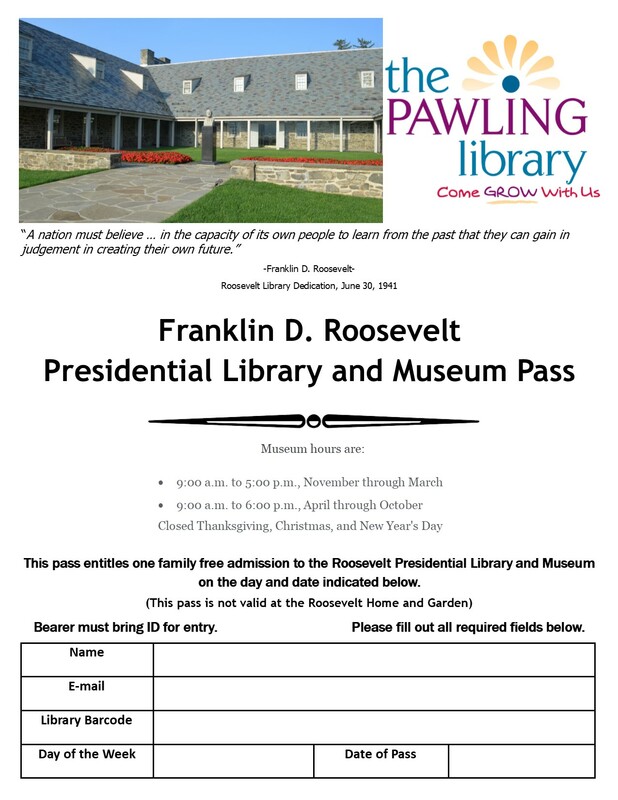 The Pawling Library provides passes to following museums to facilitate the education and growth of the people of Pawling by encouraging them to visit these great cultural institutions. Call or stop in to reserve one of our passes today. The library has tickets for free admission to the AMNH. Patrons will be given up to 2 tickets per family when they present their library card. The tickets are good for admission and give you access to the museum and show / exhibit. The Biodiversity and Environmental Halls, which offer a vivid and inspiring vision of the spectacular beauty and abundance of life on Earth. The Birds Halls portray the wide variety of avian life on the planet, and the Hall of Reptiles and Amphibians reviews the anatomy, behavior, and various adaptations of these vertebrates. The Earth and Planetary Sciences halls showcase remarkable specimens, including meteorites, minerals, and rare gems, that offer clues about the origins of our solar system and the dynamic processes of our planet. The Mammal Halls with precise depictions of geographical locations and careful, anatomically correct mounting of the specimens, the dioramas in the Museum’s Mammal Halls are among the most renowned in the world. The Fossil Halls, one of the premier attractions, including its two famed dinosaur halls in the David H. Koch Dinosaur Wing, as well as the Lila Acheson Wallace Wing of Mammals and Their Extinct Relatives. The Hall of Human Origins explores the evolutionary story of the human family, while the Cultural Halls examine the cultures of Asia, Africa, North and South America, and the Pacific. Our pass is valid for free admission for up to six people. Additionally, children under the age of three always get in free. The Danbury Railway Museum, which is located in the historic station and rail yard in downtown Danbury, Connecticut, offers railroad history, tours, train rides, a collection of original and restored rolling stock, and opportunities for hands-on railroad work at “12 inches to the foot” scale. General admission to the Museum includes entry to the Museum building and its exhibits and operating layouts, and a tour of their 6-acre Railyard with over 70 pieces of historic railroad equipment and artifacts. Train rides are available on weekends April – November. Our pass is valid for free admission for one family. Historic site features the home and estate of Franklin D. Roosevelt, Springwood, and the Franklin D. Roosevelt Presidential Library and Museum, the only Presidential Library used by a sitting president. It was conceived and built under President Roosevelt’s direction and opened to the public in 1941.The Library’s mission is to foster research and education on the life and times of Franklin and Eleanor Roosevelt, and their continuing impact on contemporary life. Our pass grants admission to 2 adults (or grandparents) and all children under 18 from one household to the Mid-Hudson Children’s Museum. The mission of the Mid-Hudson Children’s Museum (MHCM) is to empower young children and their families. The vision of MHCM is to create a community in which each and every child develops curiosity, confidence and self-worth. With support from State Senator Terrence Murphy, we’re excited to offer our 3D printer, an Ultimaker 2, for our patrons to use. While 3D production and design are not new technologies, the recent advent of affordable 3D printers now makes it possible for hobbyists and consumers, old and young, to begin experimenting with designing and creating their own 3D objects. Today, reliable inkjet and laser printers, combined with software like Microsoft Office and Adobe Photoshop, have brought us to a place where desktop publishing and the skills necessary to do it are commonplace. In the future, designing a pair of shoes or a phone, and printing your design at your house might become the norm. We’re excited to make this technology available to the members of our community, from grown-up experimenters to young tinkerers. The kid 3D printing a toy today might be the technician 3D printing your new heart or liver in 20 years. Cost will be determined by the filament weight of the item printed. The current rate is $0.20 per gram (All prints under 5 grams will be rounded up to $1.00.) of the total weight of the final print. The library will host periodic classes on 3d Printing and Design for interested member of the community. In the meantime, you can get started with 3d Design using the following free resources. Tinkercad.org – Software and lessons to get you started designing in 3d. Sculptris – Software for digitally sculpting 3d models. Autodesk – Free 3d design software for educational purposes. Young babies benefit from story time, singing, bouncing and dancing, and socialization. This is our regularly scheduled nine week program for our youngest patrons. To improve and encourage the acquisition of language and a love for reading, we’ll sing, bounce, play, and laugh. Each session ends with 10-15 minutes of social play. Babysitters have the responsibility of caring for children and making important decisions while they are in charge. Parents entrust their child with the babysitter, therefore, it is crucial he or she knows the basics of child care. In this Introduction to Babysitting Course, participants will learn interviewing tips, communication skills, ages and stages of young babies and toddlers, safety and first aid tips, and feeding and caring for children, including diaper changing. A simple test will be administered at the completion of the course and certificates of completion will be distributed. The instructor has taught Kindergarten and is currently a 2nd grade teacher. She holds three teacher certifications including Early Childhood, General Education and Special Education and a Master’s Degree in Literacy. Please bring a pen, a notebook, and a packed lunch. Prepare your child for school with the structure and fun of our weekend toddler program! This program incorporates sensory, art, storytelling, music, and movement all in one to prepare children to read, write, and think critically. Topics vary by week, and the program ends with activity stations. Parents and caregivers required to remain in the library for the duration of the program.